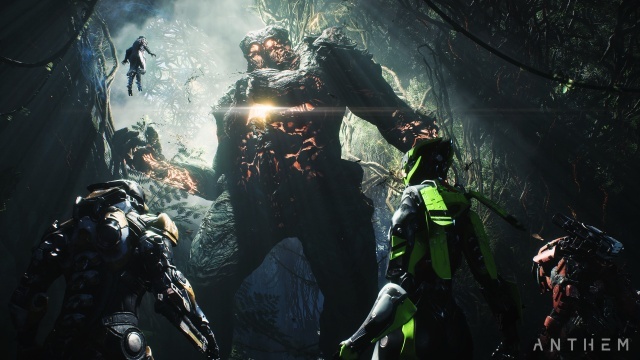 In Part One of my preview of Anthem I looked at the early part of the game. After spending some time in my Ranger and Colossus Javelins, we moved on to the endgame. Bumped up to the max level cap, I had all of the Javelins at my disposal, and this time I decided to take the Storm out for a test drive. The Storm is the elementalist of the Javelins. Its special weapons draw on the powers of flame, ice, and electricity, allowing you to unleash balls of fire, torrents of ice, or bolts of lightning at groups of enemies. Your armor is a bit on the lighter side, but you'll never really have to get too close to the enemy. A typical encounter had me thinning the ranks of approaching enemies with gunfire, and then lifting off of the ground to hover above the attackers, raining bolts of lightning down on them and watching it arc through the group. My role in a team was to be the area of effect specialist, knocking down the health of a group of enemies so that my squad mates could more easily finish them off. Playing a Storm Javelin felt a lot like being Iron Man, hovering above the battle and sending bolts of energy down from above, and it did so better than any actual Iron Man game that I've ever played. After getting my feet wet with the new Javelin in Freeplay, I teamed up with three other Freelancers and headed into one of the game's Stronghold levels. Strongholds are like dungeon runs - some story, a lot of fighting, and a boss waiting for you at the end, with plenty of loot drops along the way. If you're a Destiny player, then you can think of Strongholds as being similar to that games' Strikes. The Stronghold was quite large, designed to be traversed by flight and giving you plenty of room to maneuver on foot and in the air during the extended battles. There are some puzzles to be solved, but the ones I encountered felt more like a way to give you a break from the long battles than a major component of the Stronghold experience. Cooperation seems like it will be an important part of these puzzles, with players working in concert to open the way ahead. The boss battle we faced was a multi-stage affair, with our team alternating between attacking the boss and the shield generators that would kick on to protect it, all while contending with numerous minion enemies. Surviving the battle required that we took full advantage of our Javelins' maneuverability. From my brief time with the endgame, it looks like reaching the level cap will reward you with powerful Javelins. While you are an impressive war machine, the enemies are tougher as well, so you'll still face some challenge, especially at the harder difficulty levels. The endgame will also provide world events known as Cataclysms, contracts, and daily, weekly, and monthly challenges, but this part of the game wasn't enabled in the build that I played. My takeaway from my brief time with the endgame is that it will be both challenging and a different experience from the story campaign, and that there will probably be enough there to keep you playing once you reach it.